I consider myself to be a fan of almost all types of board games. But, my game group generally gravitates to medium-to-heavy weight games. I just love having interesting decisions to make throughout a game. That said, sometimes it is just more fun to build, throw, and flick things around the tabletop. Or maybe you just need a filler between games and have a few minutes to shut the brain off. Enter the dexterity game. 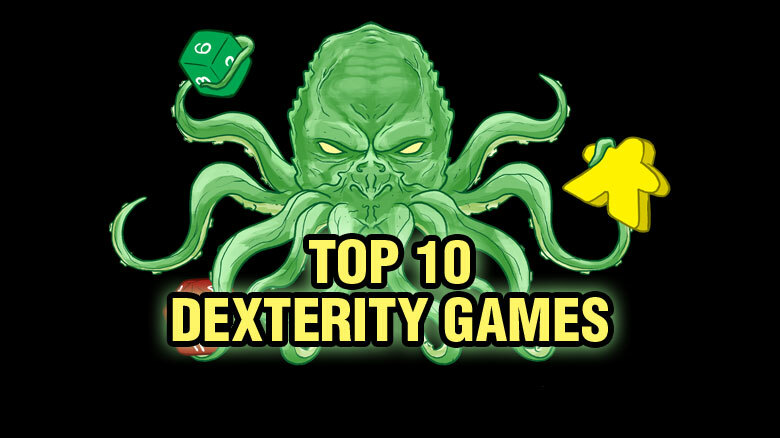 While there are lots of dexterity games with different themes and mechanical twists, these are my personal top 10. First off, yes, this could just be Loopin’ Louie. But, Star Wars! 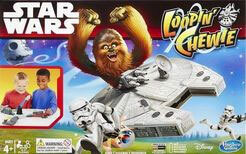 In Loopin’ Chewie, 2-3 players use a paddle to attempt to keep the Millennium Falcon in the air and away from their Stormtroopers. The player with the last Stormtrooper remaining wins. Loopin’ Chewie plays in just a couple of minutes and really works well with all ages. There are even some non-official modifications out there to combine two sets for a 6 player game. Geistesblitz 5 vor 12 is a speed game where players try to be the first to recognize and grab the appropriate piece. There are 9 pieces, a white ghost, and two other pieces in four other colors. Each round a card is flipped up that shows three of the objects. You want to be the first to grab the object which doesn’t match a color or shape on the card. But not, of course, if the card depicts an object in its color, then you want to grab it instead. Or if there is an object reflected in the mirror you just want to grab the reflected object. Or if the clock and ghost are shown, don’t grab anything… just yell out the time on the clock. 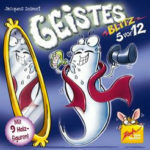 Geistesblitz 5 vor 12 is a lot of chaos, but a lot of fun as well. 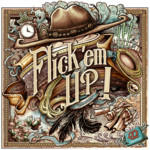 Flick ‘Em Up is an old west themed dexterity game where players play in teams against each other. Wooden discs are flicked around the game to move and shoot at the other team. It’s extremely satisfying to shoot a long distance across the table and damage your opponents and then move behind a cactus for cover. The chunky wooden bits really make Flick ‘Em Up come to life. There are different scenarios that can be played, some more complex than others, that help repeated plays feel unique. I’ve often wished to have the space for an air hockey table in my house. Unfortunately, Klask is probably as close as I’m going to get. Klask is a two-player game that feels a lot of tabletop air hockey. You control your piece via a magnet under the board with the goal of hitting the ball into the opponent’s goal. There are three small magnets in the middle of the board that serve as obstacles. If two of those magnets attach to your piece, you lose the point. Its quick playing and feels very much like playing an arcade game without having to leave your house. 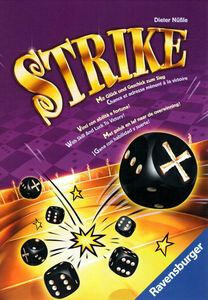 Although Strike was published in 2012, it seems to have picked up somewhat of a cult following in the last year or so. Unlike many dexterity games, it has a really small footprint and can be played basically anywhere, so lots of folks at conventions seem to always be carrying a copy. Players get a number of six-sided dice based on amount of players. But the dice are numbered 2-6 and the sixth side has an X. Each turn players will throw one of their dice in the arena. All dice showing an X are removed from the game and any that have a matching number are returned to the player. The last player who still has dice wins. I’m slightly embarrassed to say that Strike is one of my most played games of the last year, but is almost always the go-to when waiting on the rest of the game group to arrive. 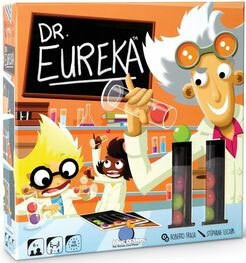 If you’ve ever wanted to be a scientist, Dr. Eureka may be the dexterity game for you. Players race to make the formulas on a card with their three test tubes and 9 molecules. There is a bit of a puzzle element as well, trying to figure out how to move the molecules around, as you cannot touch them with your hands or let them touch the table. Whoever completes the formula first claims the card and the first to 5 wins. There is an expert variant in Dr. Eureka where you can’t set any of the test tubes down if the normal version is just too easy for you. You are a monkey… flinging coconuts. Definitely coconuts. Soft, brown, mushy…coconuts. 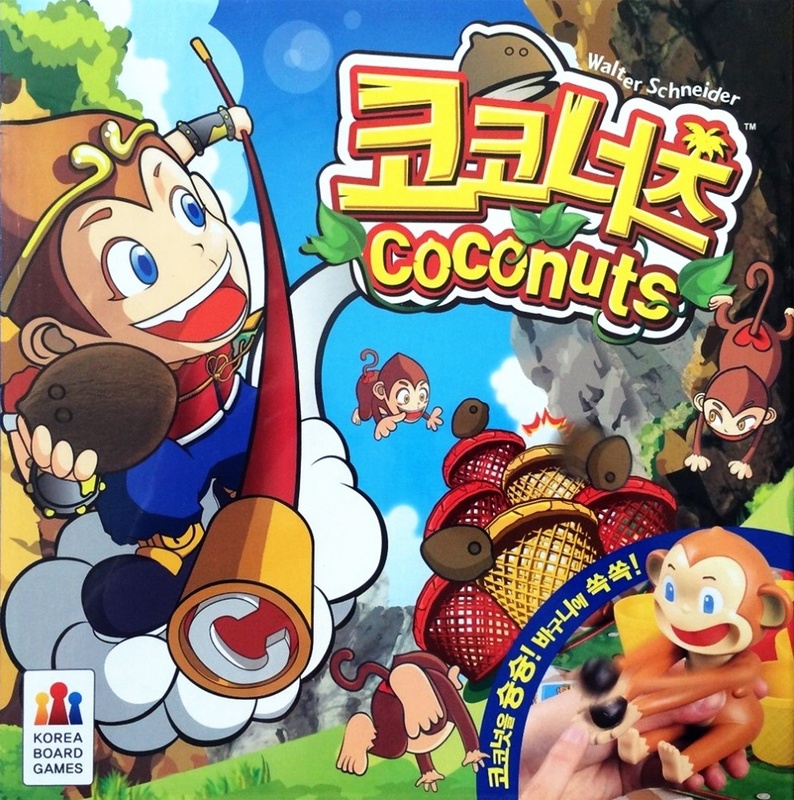 Each player uses a plastic monkey as essentially a catapult trying to land a coconut into plastic cups. Once you’ve captured five cups into a pyramid, you win. But other players can land in the cups you’ve already taken and steal them from you. It’s a fast-paced game and the unpredictable way the coconuts bounce around the table leads to a lot of hilarious moments… and crawling around the floor looking for some when it is over. HABA makes some great games for kids, including many dexterity games. 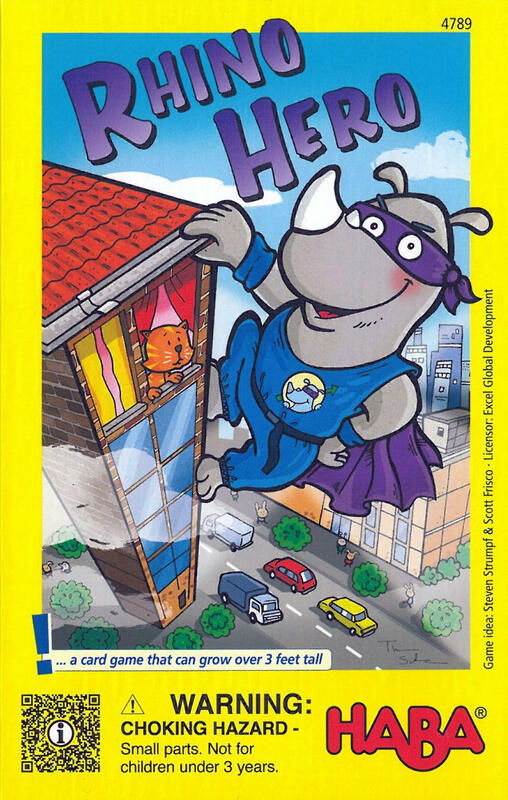 The best of which is definitely Rhino Hero. Players make essentially a house of cards using the roof tiles from their hand and a supply of wall cards. Roof cards may have special abilities: allowing a player play an extra card, reversing the turn order, or making the next player find the Rhino and place him on the roof. The first player to play all of their cards or the player with the least cards when it all comes crashing down wins. 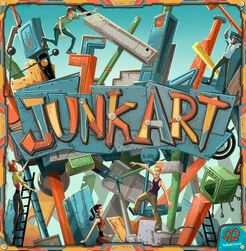 Released at Origins this year, Junk Art has quickly become one of my favorite dexterity games. There are 60 wooden pieces of varying shapes and colors and a deck of cards which shows each of these pieces. The best thing about Junk Art is that it is really 10 games in one. There are 10 different “cities” in the game with different rules and scoring. Each game you will play three of the cities. You may need to build the tallest or fastest. Each player may have their own structure or build on a common structure. And each structure does end up looking really cool. Maybe not a priceless work of art, but I’ve certainly taken more pictures during a game of Junk Art than any other game. The variety in shapes really makes this feel unique. There are flat pieces, round shapes, long cylinders, etc. Some of them fit together nicely; other times not so much. Junk Art feels like 10 different dexterity games in one box and I’ve really enjoyed every time we’ve got it to the table. As a kid, I loved building slot-car racing tracks. 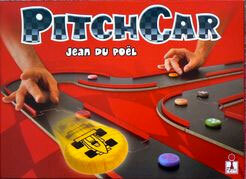 PitchCar gives me the satisfaction of building a cool race track without the disappointment of the slot-cars never actually working. Once you’ve built the track you will flick a wooden disc, representing your car, around the track trying to be the first to cross the finish line. There are numerous expansions which add ramps, sharp curves, crosses, and lots of other cool obstacles. Building the track in PitchCar is far and away my favorite part of the game and can take quite a while to get it all laid out. It’s not as quick playing as the other games on my list, but really can turn a game night into a cool event. I’m surprised you didn’t include terror in meeple city since you have it a 5. Where is the Ice Cool?! Oh man, that one would have been close to making the list. I don’t love how the random score cards work. But it is cool and I do like it. I’m also surprised that Rampage (T.I.M.C.) isn’t included in this list. I’ve played (granted 1) scenario of Flick Em’ Up. It was alright, but I chose to own Rampage over it. 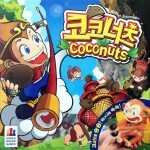 Personally, Coconuts is one of the most hated games I have played. I’ve not tried that one. I’m sure Andrew forgot it like he did Rampage. I find your lack of Rampage (Terror in Meeple City, ugh hate the rename) disturbing.